Nashville-based All Them Witches play a modern variety of psychedelic blues. The four-piece group’s heavy music has caught on with audiences in a big way; like the four albums that came before it, 2017’s Sleeping Through the War is earning near-unanimous critical acclaim. The band is currently on an American tour that runs through mid-June (including two nights at Pittsburgh’s Club Cafe); then it’s off to Europe for a series of concerts and festival dates. All Them Witches has made a point of recording some of their albums using unusual methods. A 2013 EP was recorded using only two microphones; the band’s 2015 album Dying Surfer Meets His Maker was recorded in a cabin in rural Tennessee. Parks believes that the recording methods used do have an effect on the nature of the final product. “Experimentation helps us not get locked down,” he says. Unlike groups who believe that audience recordings of shows cut into artist profits, All Them Witches don’t discourage fan “taping” of their concerts. “I love the culture of capturing a live show,” Parks says. He notes that a lot of bands have done great shows “that never get heard by anybody else,” and trading recordings does away with that limitation. “I encourage it,” he says. Getting the music out hasn’t been a problem for All Them Witches. If one includes all of the band’s output – singles, EPs, live albums and studio releases – the group has released well over an album’s worth of music every year since 2012. And while some have suggested that the band’s music has a wider appeal now than on early albums like 2013’s Lightning at the Door, Parks says there’s no intention to make that the case. “We’re not trying to make it more accessible to people,”Parks says. “It’s just the natural progression.” Some artists might say that they do it all for the fans, but songwriter Parks is more honest with himself. “That’s a really good notion,” he concedes, “but I feel that’s kind of a lie. Because writing songs is the only way I can go to sleep at night. I do this for myself, and I do it for my friends. Anybody is welcome to join show up” and enjoy it if they choose, he says. 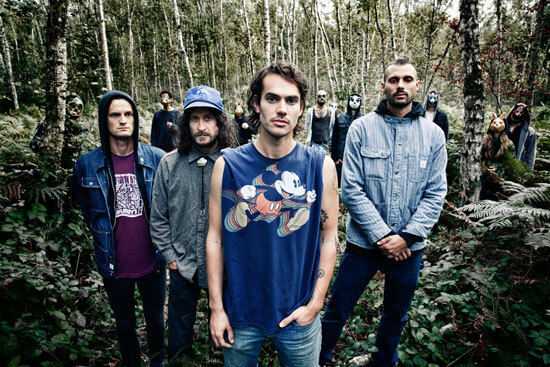 In the studio, All Them Witches makes judicious use of modern technology, but the band is careful not to take it too far and run the risk of losing the qualities that make the group unique. “We’ve always done everything live in a room,” Parks says. “So what you hear on the basic track is all there; it’s all live.” And the group limits its use of on-board studio effects, choosing instead to get their distortion the old fashioned way. “It’s all volume,” laughs Parks.